I recently got kind of obsessed with getting some Picture Polish. I'm not really an indie kind of girl, but their bottles with the cute font really drew me in, and a lot of my online polish friends really like them! So I got a couple from a fellow swapper. 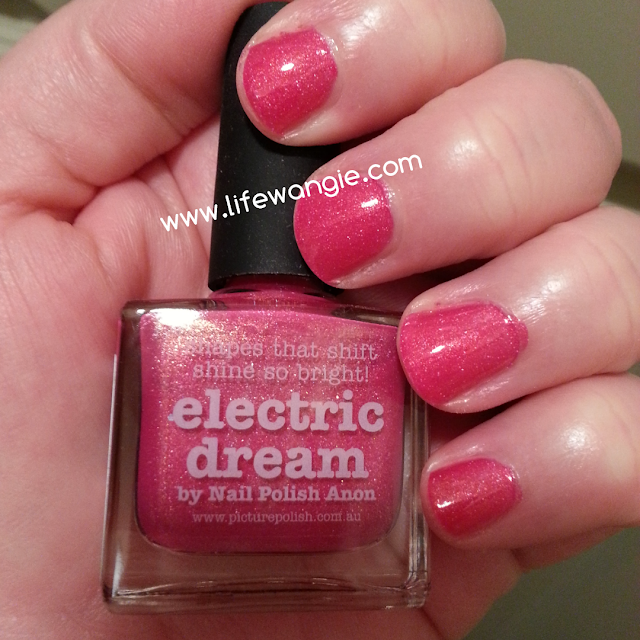 Here's a quick mani post with Electric Dream! One thing I was super excited about, and no one had told me about Picture Polish is that the handle is rubberized! I love a rubberized handle. It's just so much easier to work with when you are doing a mani because it doesn't slip out of your hands. Picture Polish is an Australian brand, but they do ship to the US, and there is a special deal called the "Everyday Deal" where if you buy eight polishes, you get a discount that almost covers the shipping. You can also get them from several of the sites that sell indie polish as well as from some of the sites like eBay or Storenvy where people are selling their own stash. They are a bit more pricey since they are indies, so I am going to have to pace myself, but I really like them!